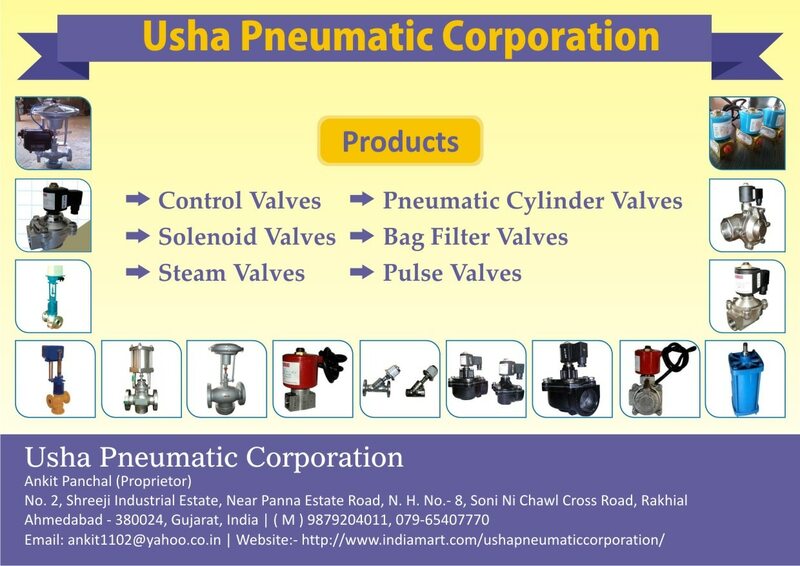 We, Usha Pneumati Corporation is pleased to bring the complete solution of Pneumatic Valve our range include the Solenoid Valve, Control Valve, Diaphragm Valve, Angle Type Control Valve, Dust Collector Valve, Pulse Jet Valve Solenoid Valve, Y type Control Valve, Direct Acting Solenoid Valve and many more. These all products are developed by taking care of the quality of the raw material used, in the result we are able to claim the best brand 'CRUZEX' of the market. Our Brand bring the happiness on the face of our client which build our confidence. How Solenoid Valve Works. A magnetic field created by and electrical current passes through coils which exerts a force on the plunger which in result plunger is pulled to the exact centre of the coil and it makes the orifice to open. This are the basic principle which are used to push the SOLENOID VALVE to open amd close. We are leading Manufacturer, Exporter & Supplier of DIRECT ACTING SOLENOID VALVE. These Solenoid Valve works on very simple principle. There is a spring working to hold the plunger down and close the valve. The plunge with rubber gasket close off the flow of the medium which passes through the small orifice. The electrical coil which is positioned around the plunger gets electrical energized and start creating magnetic field which in result pull the plunder towards the center of the coil and now the orifice is ope which allows the medium to pass through. This product is designed but our technical team under the guidance of our experienced Engineers & designers. After all finished product is passes through all necessary testing so that we can provide the quality to our customers. Features : 1) Easy to install. 2) Smooth Working. 3) High Durability. 4) Noiseless working.